Instantaneous chemical action rapidly penetrates greases, oils, grime and dirt. Contains our exclusive rust inhibitor. Rids equipment and machinery of encrusted oil and grease. Effective for cleaning out oil storage tanks. Easy to use. Simply spray on, wipe or hose off. Safer and more environmentally friendly than acetone. ***Comes with a trigger sprayer for easy application. Why Choose Mag 44 Degreaser? Nonflammable: Mag 44 degreaser is the safer safe choice for cleaning parts in welding areas. Safe for Employees: Mag 44 degreaser is nonhazardous and non-flammable. Nonhazardous: Mag 44 does not need to be stored in a special cabinet for flammable materials. Extremely Versatile: Use the same cleaner for machines, garage floors, parts & more. Smells Good: No strong fumes. Dilutable: In most cases, Mag 44 can be diluted with up to 6 parts water to one part Mag 44 for general cleaning – you save money! 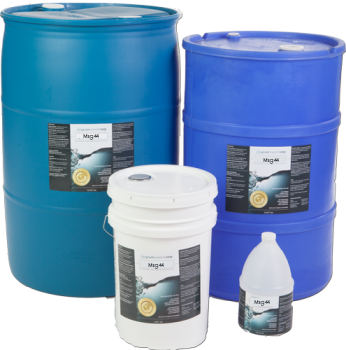 Affordable: Mag 44 is less expensive than many competing solvent degreasers, and thanks to its higher dilution ratio, Mag 44 degreaser is typically a better value than acetone. Plus, you avoid hazardous shipping charges. Staging Dimensions in New Castle, Delaware, has embraced Mag 44, a biodegradable degreaser offered by Magnum Research Corporation. Here, Norm Valora, manufacturing engineer with Staging Dimensions, talks about the company's recent switch from acetone to the environmentally-friendly, non-flammable Mag 44. Staging Dimensions is a manufacturer and distributor of quality, versatile, portable staging products and accessories. For more information on Staging Dimensions, visit http://www.stagingdimensionsinc.com.